Liquid concentrate free of any aldehydes and phenols, designed for non-protein fixing cleaning and disinfection of non-critical instruments and medical devices. Prepare a 2 % (20 mL with 980 mL of water) dilution in a disinfecting container. BIB forte is suitable for the use in ultrasonic devices. 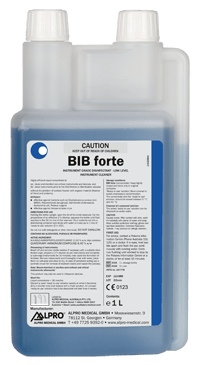 BIB forte is a carefully adjusted formula with extraordinary corrosion inhibiting qualities with prevention of rust formation and corrosion problems on steel instruments. Modern combination of alkylamine and biguanide.